As the earthquake sequence continues in Kissamos, with a 4.0 magnitude quake this morning, I thought it was time to do some research. Haniotika Nea have interviewed the Director of research at the Institute of Geodynamics at the National Observatory of Athens, Mr Athanassios Ganas, who says that the earthquakes are part of the seismic sequence in the same focal area. He says that the sequence is a smooth progression and that the earthquakes are a new activity. It appears that a new crack in the crust has been created at about 10-15 km depth, running North to South between the villages of Lousakies and Livadia, but it cannot be determined if the crack is the cause or the result of the new seismic activity. He states a that the earthquake sequence is unlikely to have finished, as yet. 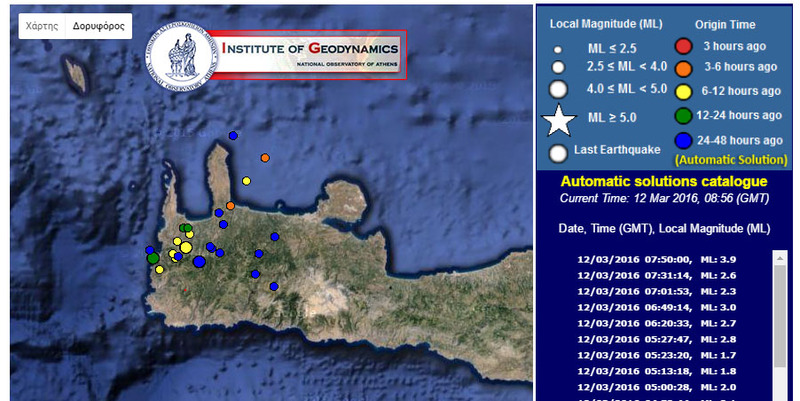 UPDATE: A new report from Haniotika Nea implies that the quakes will last for another week, according to the director of the Laboratory of Geophysics & Seismology in TEI of Crete, Dr. Philip Vallianatos.